trails around the cities of India that portray the country in its real colours. Beginning from Delhi's cosmopolitan culture, the tour extends towards the west, in Jaipur, where royalty rules the world in its vibrant hues. Agra hosts the monument in white which is face of India – The Taj Mahal. Khajuraho in Madhya Pradesh presents the depiction of desires in brown stone temple carvings. On arrival transfer to Hotel. Overnight at the Hotel. Early morning proceed for Jaipur popularly known as the Pink City, built in 1727 AD by Maharaja Sawai Jai Singh II. On arrival Start with Sightseeing of City Palace in the heart of Jaipur which is known for its blend of Rajasthani and Mughal architecture. 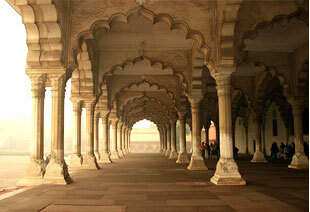 Later late afternoon is kept free to visit the famous Markets of Textiles, Gems, Carpets, and handicrafts. 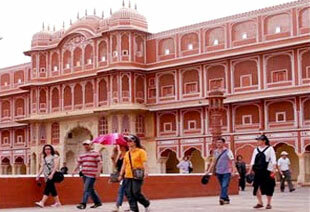 Jaipur is an ideal place for buying souvenirs, Overnight at the Hotel. Morning take a photo tour of The Hawa Mahal or the Palace of Winds was constructed for the royal ladies to watch the royal processions without being seen, visit to Amber Fort, situated just outside the city, enjoy the experience of ride on elephant back to and from the top of the hill on which the fort is situated. Amber Fort is the classic Romantic Rajasthani Fort Palace, late afternoon proceed for Agra via Sightseeing of Fatehpur Sikri a masterpiece in sandstone with stunning elegance of its palaces & courts. Notable among them is the Diwan-e-Khas; Punch Mahal, the Tomb of Salim Chisti, and the Bulund Darwaza On arrival Check in at Hotel. Overnight at the Hotel. Early morning visit to witness incomparable Taj Mahal with its' speculative view at the time of Sunrise. Taj Mahal one of the Seven Wonders of the World and surely the most extravagant expression of love ever created. 20,000 men laboured for over 17 years to build this memorial to Shah Jahan's beloved wife. After that visit to the Agra Fort from where one can get the most moving view of the Taj from the little octagonal tower in the Agra Fort, which lies, across the river Yamuna. Overnight at the Hotel. Early Morning Transfer to Railway Station to connect Train Shatabdi Exp for Jhansi at 08:20, arriving 10:20 at Jhansi station, On arrival drive to Khajuraho via visiting Orchha historical site with magnificent temples and monuments. Visit Jehangir Mahal, Raj Mahal, Raj Praveen Mahal, Chaturbhuj Temple, Laxmi Narayan Temple, Orcha Palace and Panoramic view of Betwa River. Continue your drive to Khajuraho. On arrival check in at Hotel. Overnight at the Hotel. Morning explore Khajuraho, is worldly known for its magnificent temples of erotica built between 950 A.D. and 1050 A.D. take a sightseeing tour of Western group of Temples consisting of the massive Laxman Temple dedicated to lord Vishnu, the Laxmi and Varaha temples dedicated to Vishnu's consort Laxman, the Kandariya Mahadev temple dedicated to Lord Shiva and the Chausath Yogini temple dedicated to goddess Kali. Later connect flight for Delhi, on arrival free for shopping and visit India Gate, Rastrapati Bhawan for short Delhi city tour. Dinner and then Connect International Flight for onward destination.